Sub,” a baguette stuffed with turkey meatloaf, Utah Valley cheddar, balsamic red onions, Sriracha-spiked cranberry ketchup, spinach, and horseradish, and the dessert menu includes the valley’s best brownies and cookies. Have lunch at all of these places, and then, when you have more time and are looking for a lunch experience, head to Teton Pines, Turpin Meadow Ranch, or Brooks Lake Lodge, where the food is fabulous, and the Nordic skiing is even more so. On the Moose-Wilson Road, between Wilson and Teton Village, Teton Pines’ Nordic Center is open daily, from 9 a.m. to 4 p.m. Trails here are as well-kept as the resort’s Arnold Palmer and Ed Seay designed 18-hole golf course. Sixteen kilometers of trails wind through the golf course and its gorgeous homes, in several loops of varying difficulty. Lessons are offered in classic and skate skiing, and equipment rentals are available on-site during winter activities. Because you’ll be coming here after a couple of laps around the Pines’ Nordic track, skip the Cobb Salad (even if it’s the best Cobb in the valley) and instead, go for Teton Pines’ gourmet burger. It’s not meant to be a secret, but even many longtime locals don’t know that the Pines serves some of the best meat in town, and this includes the ground, Mead Ranch beef used in their burgers. Topped with melted Gouda, fire-roasted bacon relish, herbed aioli, then served on a brioche bun, this might be one of the best burgers you’ve ever had. A one-hour drive from Jackson’s Town Square, Buffalo Valley’s Turpin Meadow Ranch was totally remodeled in 2014, but it originally opened in 1932 as a gas station and rest stop at the base of the western side of the first road over Togwotee Pass. The highway over Togwotee Pass has long since been replaced and rerouted, but the original road does still exist (it begins climbing the pass directly behind the main lodge). In the winter though, the old road is not plowed past the lodge, making the lodge the literal the end of the road and making an afternoon spent skiing and eating here feel like a true escape. 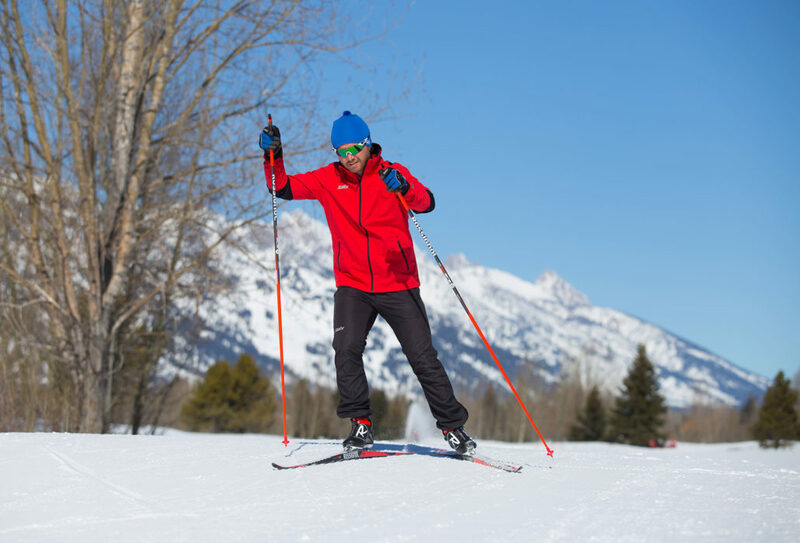 Having opened on December 31, 2013, Turpin Meadow Ranch became Jackson Hole’s first destination Nordic ski resort. Jackson locals, Hans and Nancy Johnstone, who both competed in the biathlon in 1992’s Albertville Olympics, partnered with conservationist and CEO of outdoor gear company Outdoor Research, Dan Nordstrom, to resurrect and revamp the historic dude ranch. The Johnstones designed 25 kilometers of cross-country ski trails to provide varying levels of difficulty. Trails are groomed daily for Nordic and classic skiing, and skis and boots may be rented at the ranch. The flat, three- kilometer, Summer Homes Loop is a good trail for beginners. Lunch at Turpin Meadow Ranch is as affordable as it is filling and popular. Expect to share the main lodge’s dining room, not only with fellow skiers, but snowmobilers, fat bikers, and wildlife watchers; a large herd of bison often hangs-out in flats you’ll pass on the drive here. Oh, and there is also a wolf pack that lives and hunts in the area! The lunch menu is small and changes daily, so you’ll always find they use the freshest ingredients in everything they make. Options might include curried carrot and coconut soup, beef chili, a veggie focaccia sandwich, or bison and beef meatloaf. Finally, Brooks Lake Lodge, on the shore of Brooks Lake, in the Shoshone National Forest, was built over a six month period in the winter of 1922. At one point, it was the largest hunting/guest ranch in the country. In the 1980’s, the lodge was expanded in its original style. In the winter, the only way to access the lodge is via snowcoach, snowmobile, or to cross country ski. Because its dining room is open for lunch to non-guests, it is a popular day-ski outing. It is a five mile trip from the highway. Inside the lodge are three, oversized, river rock fireplaces. No reservations are required for lunch. There are more than 800 miles of snowmobile trails around Brooks Lake Lodge, including the famous Continental Divide Trail. Because there are so many miles of trails, many of which are groomed multiple times every week, we’ve never experienced conflicts between snowmobilers and skiers; there’s enough room for everyone to play. Also, adventurous cross-country skiers needn’t limit themselves to trails—the Shoshone National Forest is 2.4 million acres, and Brooks Lake Lodge is precisely in the middle of it. Brooks Lake Lodge overlooks Pinnacle Butte. The highest summit of the butte, which is part of the Absaroka Mountain Range and rises directly behind Brooks Lake, is 11,516 feet. In the winter, backcountry skiers climb the butte to ski narrow couloirs hidden within its cliffs. Cross-country skiers admire it from the valley floor. In the summer, it is possible for adventurous, non- agoraphobic hikers to scramble onto the butte’s summit.